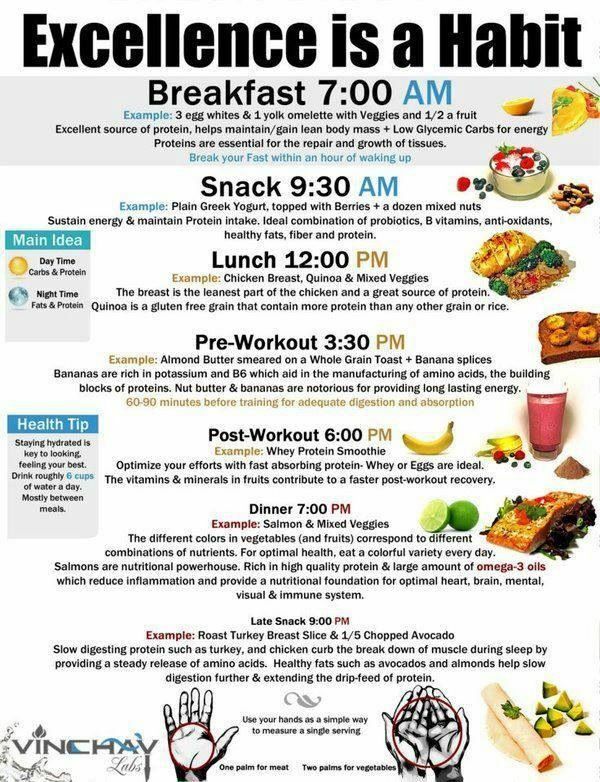 Excellent Example Of An Eating Schedule! Posted by Chris Garner – Do you have great intentions to make good choices about your health every week, but then rush into your busy day making bad choice after bad choice. One of the best ways to overcome this is to put your choices on auto-pilot. What do I mean by auto-pilot? You accomplish this with simple planning. According to Wikipedia, the definition of planning is “the process of thinking about and organizing the activities required to achieve the desired results.” In order to achieve the results of good health that you and so many of us are after, incorporate a time of planning into your weekly like. Take a few minutes on the weekend, before the week begins to create your plan for the week ahead. Here is an example of a plan to simplify your choices when it comes to your meals and snacks for the week. Determine three breakfasts, three lunches, three snacks, and three dinners to make for the week. Do the same breakfast/lunch/snack/dinner on Mon/Thur, do the second B/L/S/D on Tues/Fri, and the third on Wed/Sat. You can have a day off of planning for your Sunday, but you still want to make good choices. A free day from planning is not permission to unravel all your good work you did through the week, it just gives you a break from planning. This is just a simple example of how you can plan your week to minimize the eating on the run, which many times results in too much processed food and unhealthy sugars in one’s diet. It also helps you prepare containers of food ahead of time to take with you for days when you are on the go. Take the time to find the right plan for your week that works for you. Everyone is different and so is your schedule, but putting your eating on auto-pilot can help to increase your chances of making good choices along the way. Plan on! Visit thrivinghealthylife.com for healthy vitamins, supplements and more. 7 Superfoods You Can Add Immediately!